On November 17, the Federal Housing Administration (FHA) released its Annual Report to Congress on the Financial State of the FHA Mutual Mortgage Insurance (MMI) Fund for Fiscal Year 2014. The results are less favorable than the 2013 actuarial report had predicted: an estimated $10 billion less net worth for 2014. These results push back the FHA’s return to its congressionally mandated minimum of 2 percent in capital reserves to 2016. Most of the shortfall was driven by a downward revision in the FHA’s reverse mortgage business, driven by an increase in interest rates. (Reverse mortgages are also known as home equity conversion mortgages, or HECMs.) The FHA’s forward business—its traditional 30-year lending—suffered a more modest shortfall, stemming from the FHA insuring fewer loans than expected, not from poorer performance in the loans insured. These new numbers should not cause alarm. The annual report is based on liquidation analyses: it gives no credit for the loans made going forward, thus undervaluing the joint impact of an increase in mortgage insurance premiums plus a stronger credit mix than FHA has had historically. Plus, the lifetime economic value of the forward fund remains positive, so the FHA’s insurance premiums should be affected only modestly. 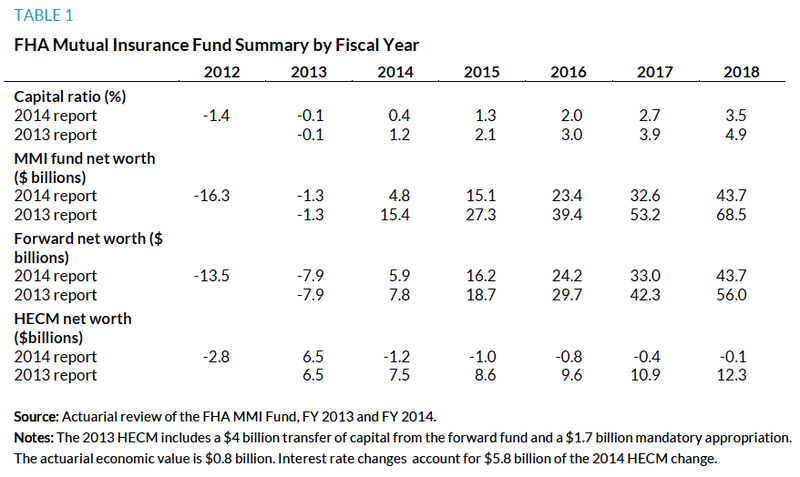 The financial position of the FHA MMI Fund has improved by $6 billion over the past year and by $21 billion over the past two years (table 1). As a result, the economic net worth of the fund has increased from -$16.3 billion in 2012 to $4.8 billion in 2014, and the fund’s reserve ratio—the ratio of reserves to current insurance-in-force—has increased from -1.44 percent in 2012 to 0.41 percent in 2014. The fund is projected to be still more profitable in fiscal year (FY) 2015, reaching the 2 percent congressionally mandated reserve requirement at the end of FY 2016. While showing a positive trajectory, these results are less favorable than the 2013 actuarial report had predicted. The 2013 report predicted that the fund would have a net worth in 2014 of $15.4 billion and reach its 2 percent congressionally mandated minimum in 2015. Why Didn’t the Fund Do as Well as Predicted? One way to answer this question is to break down the fund’s net worth into the two separate books of business: the forward book and the HECM book. At the end of 2014, the forward book of business had an actual net worth of $5.9 billion versus a 2013 projection (for fiscal year-end 2014) of $7.8 billion. The $1.9 billion shortfall is more than explained by a $57 billion shortfall in volume relative to what had been predicted, a difference of almost 25 percent. That shortfall resulted largely from the broad market decline in refinance activity. The forward fund actually performed better than predicted in some ways. The percentage of early pay delinquencies, an important predictor of future claims, dropped more than expected, as did the percentage of loans that were seriously delinquent. Moreover, the claims rate on the liquidated bonds was lower than expected. In essence, the shortfall of the forward book was not a result of poorly performing loans, but a consequence of FHA insuring fewer loans than expected. Estimates for subsequent years were also revised downward, increasing the gap between the 2013 and 2014 estimates for 2015 and later years. Why Is the HECM Business So Sensitive to Interest Rates? Much of the reverse mortgage money that the FHA has lent is taken out up front, and half of HECM loans are taken out at a fixed interest rate. The FHA is repaid when the homeowner vacates the property through death, mobility, or prepayment. Seniors who take out reverse mortgages anticipate remaining in their homes for a long time, so these are long-duration instruments. Thus, these loans have the high level of interest rate sensitivity that characterizes long-duration zero coupon bonds. An example will make this clearer. A bank makes a 25-year loan at a 4 percent interest rate; then, interest rates rise to 5 percent. The economic value of that loan falls by almost 23 percent, because buyers expect to pay a price that reflects that they are entitled to earn 5 percent on their money. That is exactly how the HECM program is evaluated. FHA has made a loan with a long time to repayment, so a rise in interest rates will cause a large drop in the economic value of the fund. One peculiarity of MMI fund calculations is that the while the Moody’s rates used to forecast the cash flows did not change much from July 2013 to July 2014 (in fact, the 10-year Treasury note rate was actually down by 20 basis points), the OMB discount rates used to discount those cash flows went up considerably, as shown by the forward rate curve in figure 1. The OMB discount rates, used for federal budgeting purposes, are set in November for the fiscal year to end the following September. Thus the discount rates used in the FY 2014 estimates are from November 2013. Similarly, the discount rates used in the FY 2013 estimates are from November 2012, close to the lowest level of interest rates in two generations. Since low discount rates yield high current value estimates and vice versa, the FY 2014 book was substantially lower in value than the FY 2013 book. Since the FY 2015 estimates will reflect discount rates that are lower than those used in FY 2014 (albeit higher than 2013), this factor should be a positive in the 2015 HECM book of business. How Are the Projections Made? The annual report on the FHA MMI Fund is based on two actuarial reviews by the consulting firm Integrated Financial Engineering. One review covers regular mortgage loans (forward loans), with insurance in force of $1,154.8 billion. The other covers reverse mortgage loans (HECMs), with $96.8 billion in insurance in force. (HECMS make up 7.7 percent of the total FHA book of business.) Both analyses are run as if the FHA immediately ceases operations and runs off its current book of business, measuring the premiums that the FHA will collect against the projected losses. The cash flows and losses are projected quarter by quarter, vintage by vintage under many different scenarios. For the forward book of business, the report estimates prepayment speeds, claim rates, and severity rates (including expenses) vintage by vintage. The economic value of the fund is determined by the discounted value of future premium income: losses due to claims, less losses due to mitigation expenses, less premium refunds. On the HECM book of business, the termination rates are projected and used to calculate case flows. 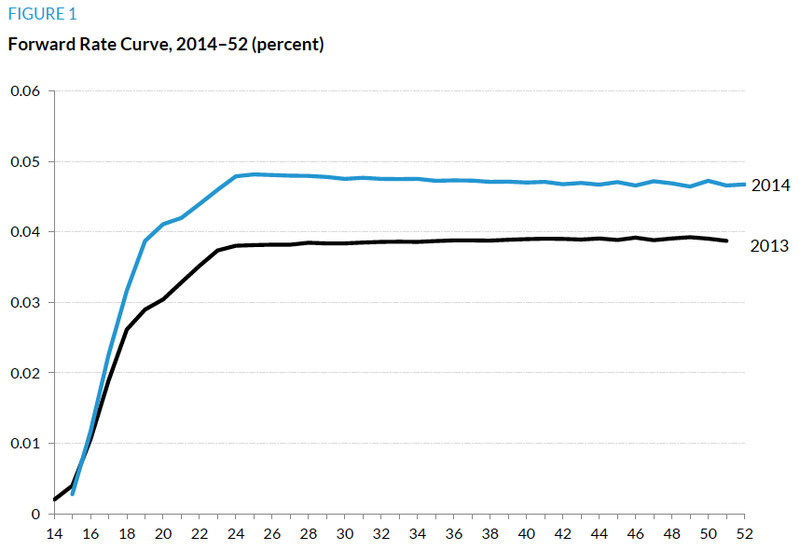 The base case scenario used for both estimates is the July 2014 Moody’s Analytics forecast of future interest rates. For each fund, the projected cash flows are then discounted back by the zero coupon interest rates dictated by the Office of Management and Budget. The economic value is then calculated by adding the existing capital resources to the discounted cash flow projection. The total numbers for each fund are then added together to calculate the economic value of the FHA MMI fund. Note that this is a liquidation analysis. It gives no credit for the loans made going forward, thus undervaluing the impact of the increase in mortgage insurance premiums plus the trend toward a much stronger credit mix than FHA has had historically. The actuarial calculations show the 2015 book of business alone will add about $10 billion to the economic value of the fund, because the premium income from new loans will be much higher than the expected default costs. What Should This Analysis Mean for FHA Insurance Premiums? Not much. First, the forward book of business is profitable, and the new book of business is likely to be particularly profitable. The actuarial estimate of the profit expected from new business is around $10 billion a year. Even if the FHA were to gravitate to a book of business that includes more loans with lower credit scores, at current mortgage insurance premiums, the book of business will still be very highly profitable. In fact, taking all years since 1992 into account, the cumulative lifetime economic value of the forward fund has been positive (table 2). Even considering only 2001–14, it is still cumulatively profitable. The issue is really how quickly the new forward books of business should be required to make up for both the unprofitable reverse mortgage business and the unprofitable 2001–09 forward book of business, when forward premiums were too low and when lending standards were too lax. Copyright © January 2015. Urban Institute. Permission is granted for reproduction of this file, with attribution to the Urban Institute. The views expressed are those of the authors and should not be attributed to the Urban Institute, its trustees, or its funders.